When you’re on your Carnival Sunshine cruise, step out of the sun and try out some shade (and it’s some pretty cool shade, at that). The first thing you’ll see is the Sunshine Atrium… and let’s just say first impressions count. From there, check out dining options – this ship has everything under the Carnival sun – like Guy’s Burger Joint, BlueIguana Cantina, Fahrenheit 555 Steakhouse and JiJi Asian Kitchen. Some of the greatest Carnival bars are here: RedFrog Pub, BlueIguana Tequila Bar, SKYBOX Sports Bar and Alchemy Bar… plus the already-classic Havana Bar! You’ll enjoy musical revues from Playlist Productions, while Hasbro, The Game Show gets cruisers like you up on stage, competing in larger-than-life family favorites come to life. 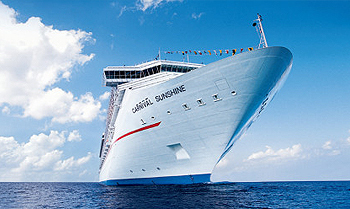 View all Carnival Sunshine cruises or view more options for Carnival cruises. A spot that’s intriguing by night and friendly anytime, step into the Havana Bar and be transported to an antebellum Cuba preserved today in old postcards, vintage literature…and classic delicacies. Take in great ocean views as you taste something authentically Cuban: cafe Cubano (that’s Cuban coffee! ), handcrafted cocktails of Cuban origin (think daiquiris, mojitos and more), or mouth-wateringly fresh – and wallet-wateringly free – Cuban pastries. And this spot definitely doesn’t cool down when the sun goes down, with music and dancing keeping things hot well into the night. Nobody can get the party started like a great DJ, right? That’s why we’ve brought DJ IRIE into the mix (pun intended) to make the nightlife on board Carnival hotter than ever. He’ll be heading up “DJ IRIE’s Spin’iversity,” a program designed to train our DJs to keep their spinning skills sharp and their personalities party-ready. Oh, and as for music, graduates will be spinning expanded musical catalogs in clubs across the fleet for maximum guest body-rocking. You don’t need to be a mix master to appreciate Alchemy – you just have to be up for trying something new. We’ve been mixing up some magic behind the scenes here at Carnival to produce a tasty series of all-new cocktails served at this unique vintage-themed cocktail “pharmacy.” Let our mixologists prescribe you something from the bar, with both nonalcoholic and alcoholic elixirs to remedy what ails you. Or, create your own custom concoction from a variety of unique ingredients. BlueIguana Tequila Bar is the onboard spot to chill and enjoy a slushy tequila drink or an ice-cold Mexican cerveza. The menu offers up Mexican favorites, including several brands of tequila and a slew of Mexican brews. There’s a line up of frozen concoctions, cocktails and margaritas served by the glass or pitcher and even a special Mexican beer cocktail (yes, really). Where can you find this little slice of Mexican paradise? Next to the pool, of course. So stay cool and take in the bar’s vacation vibe while you kick back on your cruise – thats what the official bar mascot Blue the Iguana would tell you. If you’re into sports, get yourself into the first-ever EA SPORTS Bar, the perfect place to catch a game and play a few, too. Grab a drink, order some snacks, watch your favorite games live on big flat-screen TVs, and keep up with real-time scores from across the sports world. And if you’re feeling that competitive spirit, you can really get right into the game with the latest video game titles from EA SPORTS. It’s free to play, so find a friend or three and get ready for action. For a relaxing time, check out The Library Bar, where great literature doesn’t stop at the wine list. This intimate cocktail lounge features state-of-the-art self-serve wine dispensers, plus bartenders who can make a fine drink. So swing by, pour yourself a bit of vino (or have our bartenders fix your favorite drink) and unwind with quiet conversation, a board game, or just by plucking a new book off the shelves for a good read. uests have told us we hit on something special with the cool Caribbean chill of the RedFrog Pub. Now we’re introducing the RedFrog Rum Bar, where the frog keeps the fun hopping day and night with all that island flava you know and love. Join the party at this poolside bar featuring a great selection of “frog approved” Caribbean rum-based concoctions available by the glass or pitcher and plenty of Carnival’s signature private-label draft beer, ThirstyFrog Red. Need a break from all the fun and sun? Grab something downright refreshing at Shake Spot, where we offer more than just your average shake. Of course, we’ve got you covered if you’re looking for a classic, but since you’re cruising, why not go for something tropical or for the adults, maybe even spiked? With a variety of tempting, handcrafted shakes and indulgent floats, Shake Spot is your cool spot for something sweet. A few things make a successful pasta dish: fresh ingredients, the right blend of spices and sauces… and of course, al dente preparation. The care and know-how of an experienced pasta pro takes it to the next level – and you’ll find them at The Captain’s Pasta Bar. Start with the pasta you’re in the mood for – linguine, farfalle, penne anyone? – then select your choice of sauce and meat, and they’ll cook it up in the same Italian culinary tradition we bring to the table nightly at Cucina del Capitano. While you’re lunching, take in the dining room’s rustic Italian country home design… there’s nothing like atmosphere to bring out the flavor in a dish.